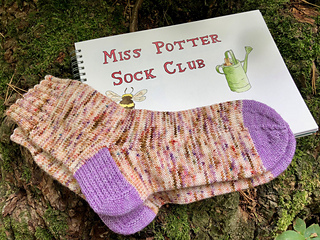 This was the third and final pattern in my Miss Potter Sock Club. The club can be purchased here. 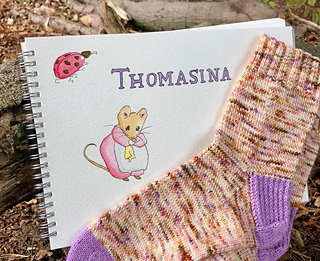 Thomasina was a member of the Tittlemouse family, and lived in a bank under a hedge. Her home was a warren of tiny passages. These lead to a variety of rooms including storerooms, a kitchen, a parlour and a bedroom. She was a most particular mouse, and spent her days sweeping and dusting her precious home. Thomasina was most disturbed by a parade of insect visitors, with their dirty feet upsetting her cleanliness and order. 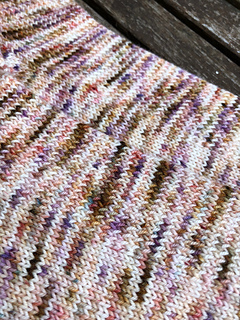 The twisted stitch pattern of this sock reflects her frenzied activity, scurrying from room to room in an attempt to bring calm back to her home. 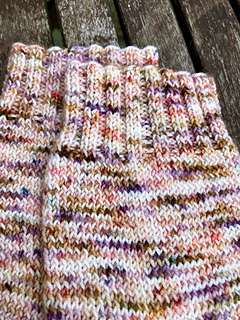 The design works perfectly with those variegated yarns that can be tricky to find a suitable pattern for. It’s a very soothing stitch pattern, perfect for relaxing after a busy day.